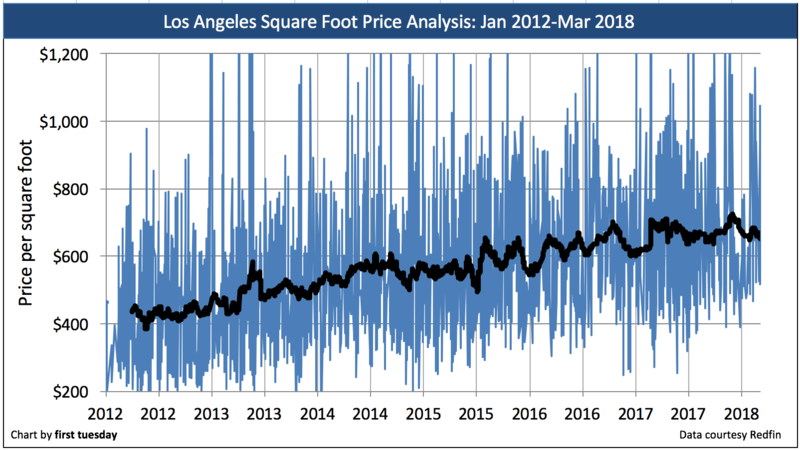 The average price-per-square-foot gave a mixed performance in 2017. 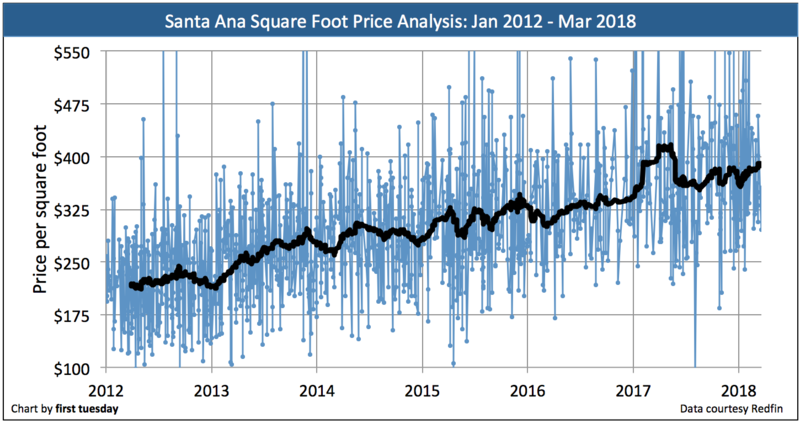 This figure continued to rise in most communities, particularly Santa Ana and Oakland, but fell back in La Jolla. 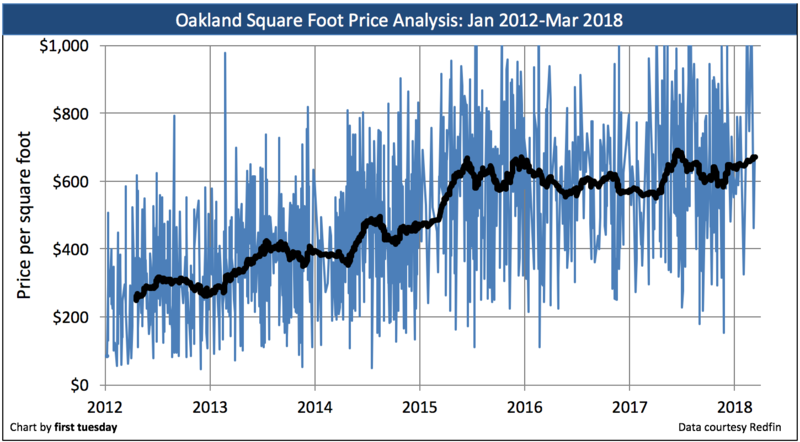 Expect home prices to increase only marginally in most communities this year as the housing market adjusts to higher mortgage rates, which will hinder homebuyer purchasing power and hold prices back from rising too quickly in 2018. 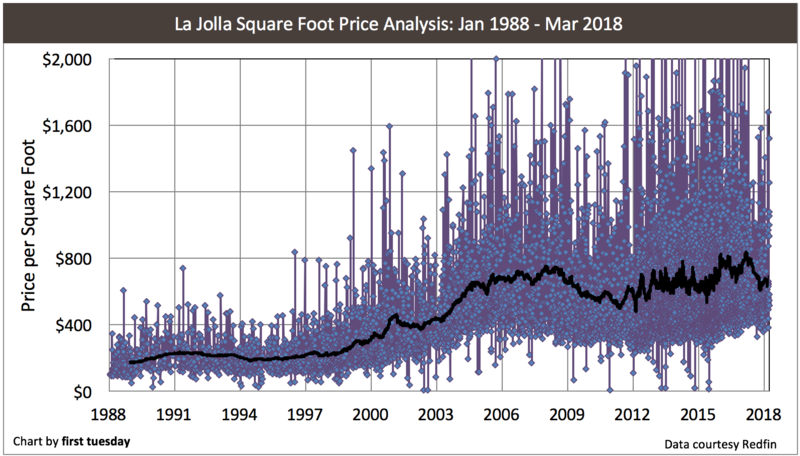 Check out the price-per-square-foot history of home sales in these eight California communities. Posted updated March 25, 2018. Original copy posted January 2012.
a short-term profile from 2012-2018. 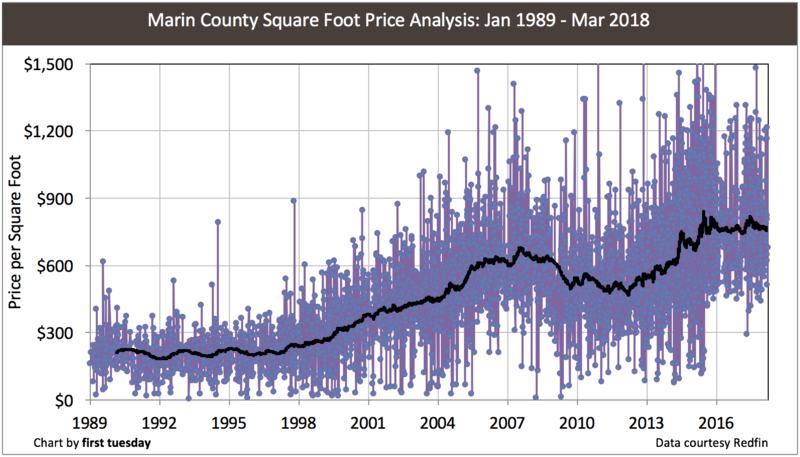 Long-term profiles indicate the market hit its bottom in 2012. 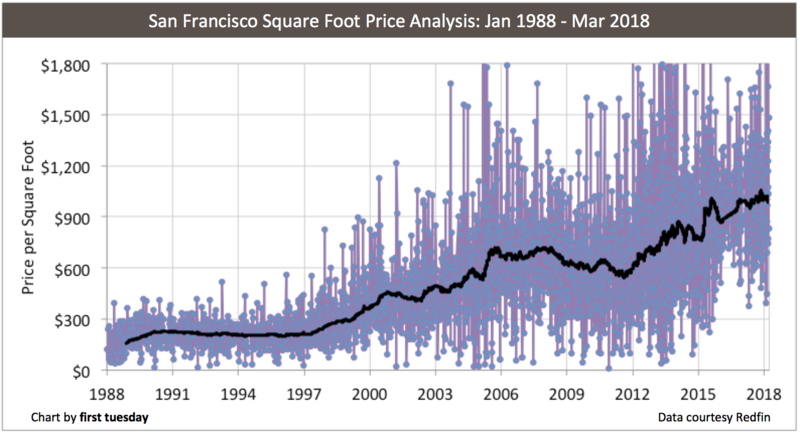 Consider 1999 and 2000 as years when prices were at historical mean price levels. 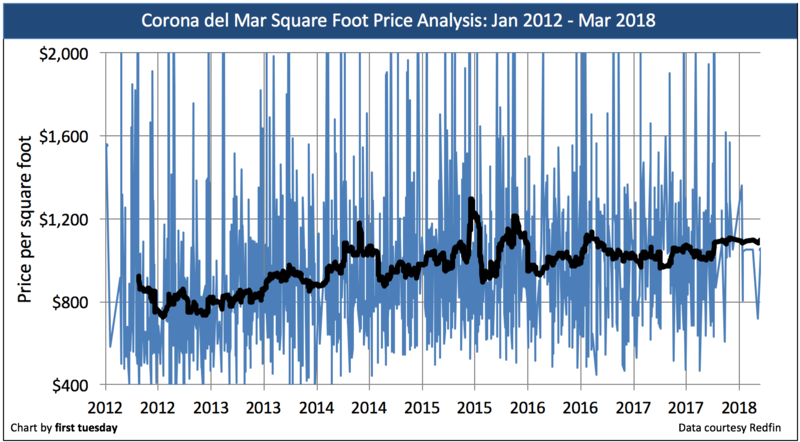 Adding roughly 2% of consumer price index (CPI) inflation per year, we can see the pricing in the present market was vastly inflated in 2013-2014. 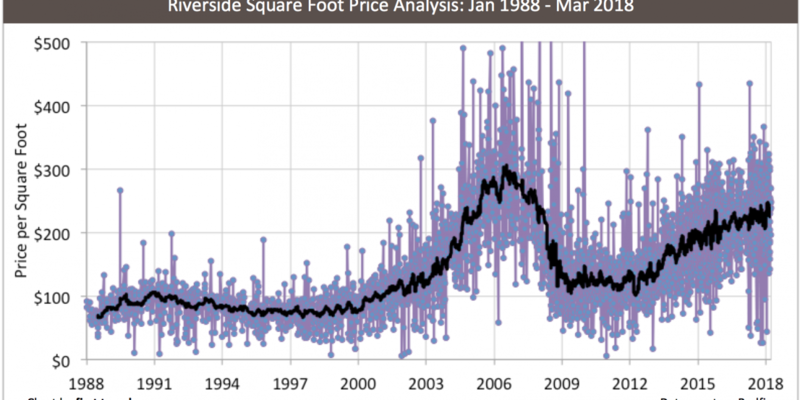 Short-term profiles show that home prices are experiencing downward pressure as we start 2016. 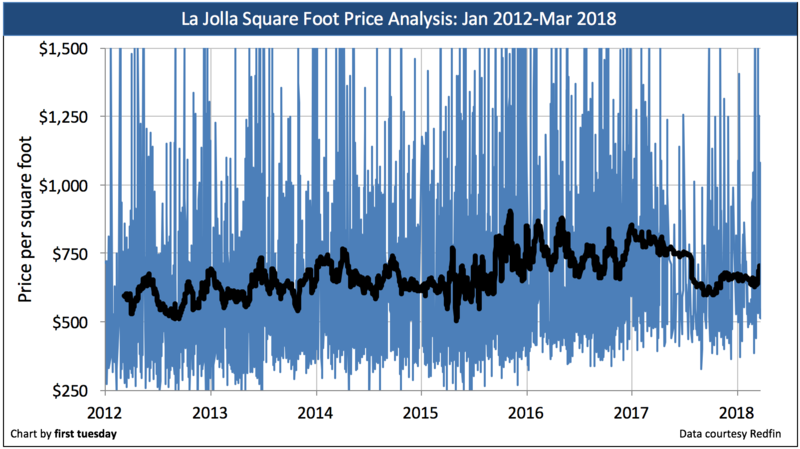 This is partially due to a depressed home sales volume in California, which, while up slightly over the previous year, lags behind what is needed to sustain the prices increases experienced in the interim. Further, with the headwind of rising mortgage rates, expect prices to level out in late-2018, to bounce back in 2019 once home sales volume picks up with fuel from the recovering jobs market. 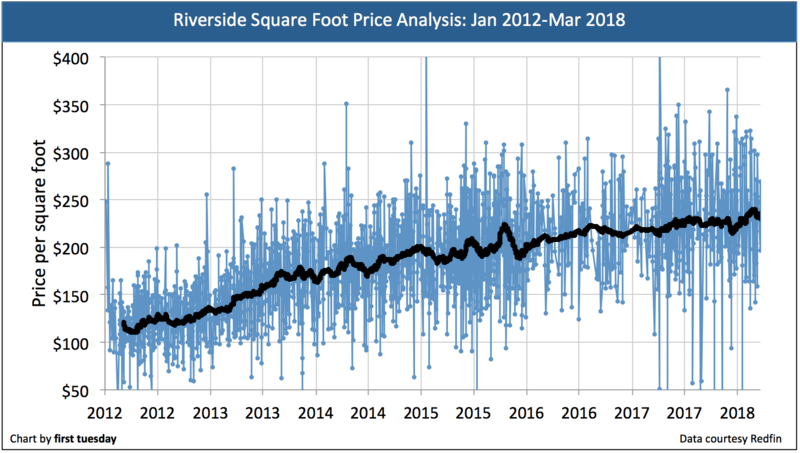 $224 in Riverside, up 4% from $215 in 2016. 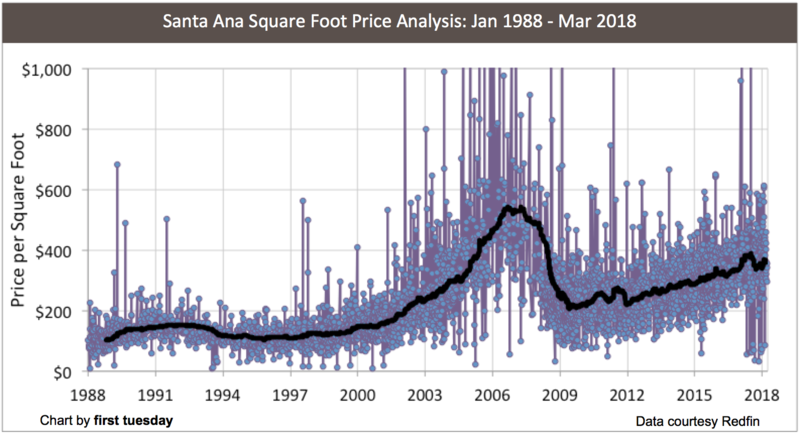 The bottom price areas largely consist of home sales of low-tier properties (a favorite of speculators). 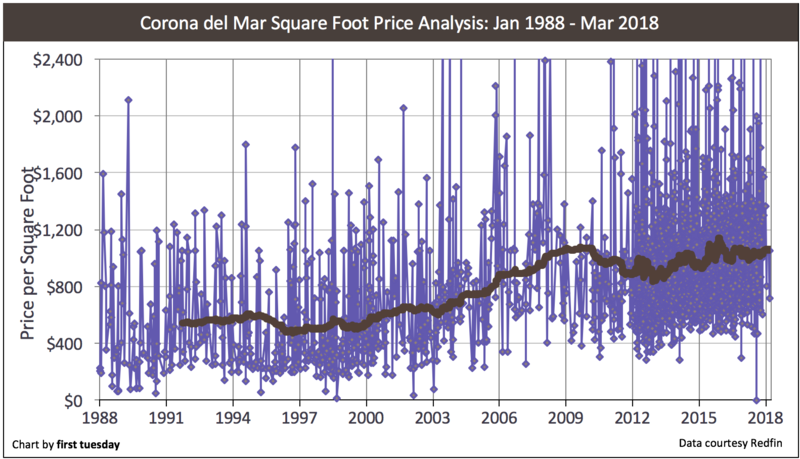 More low-tier property sales have the effect of dragging down the average price per square foot. 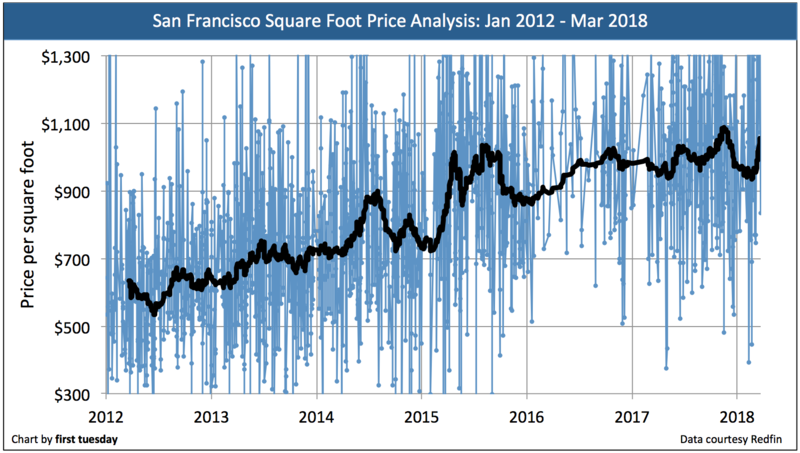 Of course, using average pricing has its drawbacks. 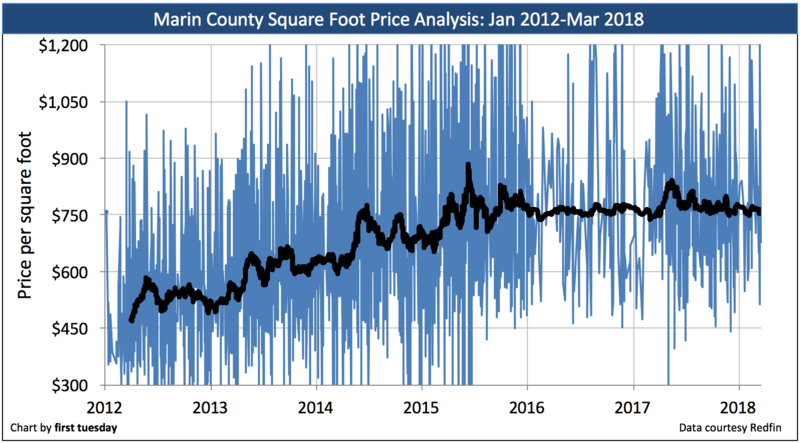 Similar to using the median price, average prices give the appearance of an inaccurate collective increase as prices in a neighborhood become less volatile. 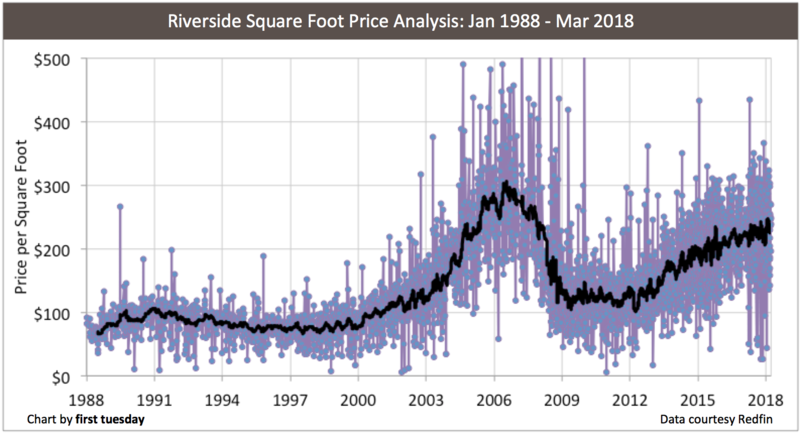 In reality, neither the average price nor the median price gives an accurate representation of market direction. NextPOLL: What percentage of your clients do NOT initial the arbitration provision? 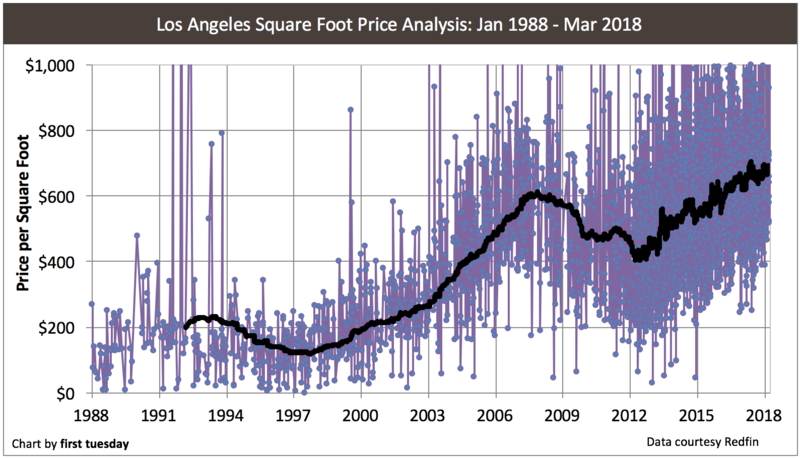 Would like to see the venice, ca 90291 area, specially properties around nowita place. Thanks. We have noticed that so many predictions about the economy and the financial arena by “experts” have fallen flat since the crisis began in 2008. The same may hold true here. Another possibility, being raised by “fringers” is that the FED will end up owning most of the properties in the United States, thereby becoming the landlord of millions of Americans, as it begins renting them out. It sounds outlandish, but is it? A cyclical occurrence has been boom and bust, PURPOSELY planned, PURPOSELY orchestrated, and PURPOSELY followed to completion. Let us explain. The persons at the top of the food chain in America, in cohorts with the government and FED, PURPOSELY initiate policies of easy money to coerce the common people to buy real property, KNOWING they will eventually lose it, as the top dogs PURPOSELY manipulate the very same financial policies and the economy to make sure they do. As millions lose their homes, there then follows a MASSIVE transfer of real property FROM the common people TO the elite. As millions are then reentering the rental market, having lost their homes, the elite then RAISE the rents substantially, and they get away with it due to a short supply of rental units and a now huge demand (which they created). The banking elite made their money on the interest charged from a loan that was created out of thin air at the moment it was made (fractional reserve banking). They then repossess the property and resell it, making money again. They really lost NOTHING, as they really gave nothing, but fabricated money for a loan. All the while this process is grinding on, the FED and the U.S. Congress by backdoor means, is feeding money into the maw of the banks, not to mention outright bailouts. In addition, the banks are receiving .25% on the money in reserves from the government. The government then “investigates” the criminal activities of the banks (which are legion), finds guilt here and there, and then levies “huge” (not really) fines in the billions of dollars for public show (as the public now hates the banks and loves when they are “punished”). Where does the money from the fines go? Even fines of $10 billion or more are a pittance to banks, which are handed money by Congress and the FED in much larger sums routinely, not to mention the $30 billion (with a B) they make just in fees per year. In olden times, in many lands, this same cycle precipitated what little wealth the plebians had BACK into the hands of the patricians. So it has been, and so it is, and so it will be until the current system of inequalities is ended by a more enlightened future populace. Meanwhile the merciless steps of the super wealthy will continue to be heard in the halls of power, treading down the common man. Historically, this can only last for so long, until finally, the jig is up, the stupefied public awakens, and it forces the elite from power—-temporarily. The elite, being the cunning campers they are, soon worm their way back into power (never having lost it completely), re-mesmerize the plebians, and the cycle begins anew. Again, as we said, this whole fetid system will finally end when a future, more enlightened populace finally evolves and prevents a recurrence of the cycle, then initiating a truly equitable and sustainable system built on high ethical and moral principles and mutual respect. 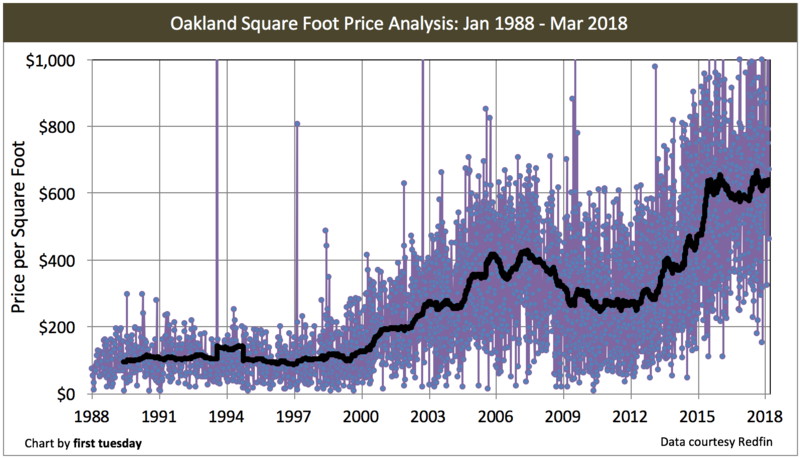 great charts, although it’d be ideal to see inflation-adjusted cost psf (the common assumption that real goods adjust for inflation turns out to be far from universally true in RE). I find your info. valuable. Would like to see Newport beach, San Clemente, San Juan Cap. with separate charts if you have.